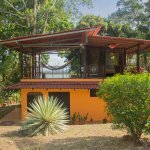 This gorgeous 2-bedroom, 2.5-bath, 1500-square-foot home is less than a five-minute walk to Playa Hermosa, one of the most beautiful beaches in the Southern Zone of Costa Rica. Enjoy the pristine splendor and warm waters of this beautiful Pacific beach. Enjoy the panoramic ocean views and beautiful sunsets every day that most people only dream about! While you’re at the beach, keep an eye out for all of the amazing wildlife in the area – toucans, sloths, and monkeys abound! Coming home is no less amazing! rinse off in the convenient outdoor shower, and then head inside to enjoy all the comfort and amenities of this lovely house! The home has high-end finishes throughout, and the high-quality construction is evident in all the details. The property also has amazing rental income potential year-round! The open-concept living area leads from the cozy living area into a large dining area, and flows into the fantastic chef’s kitchen! Stainless-steel appliances, granite countertops, a kitchen island with ample workspace and breakfast bar, and accented by beautiful glass mosaic tile! The second floor of the home includes two spacious bedrooms and two bathrooms. The bedrooms have large built-in closets, and one has a built-in desk. Both bedrooms open to a second-story patio with jungle views overlooking the pool. Both bedrooms have air conditioning, and all rooms have ceiling fans to keep everything comfortable! The upstairs bathrooms feature beautiful stone tile, glass showers, wood vanities, and high-end fixtures and finishes. The property is immaculately manicured. The home is in a gated community. There is also a large community pool, with additional amenities planned for the future! Located just a few minutes north of the town of Uvita and 10 minutes south of the town of Dominical, you have easy access to everything! Restaurants, supermarkets, banks, doctor’s offices, a veterinary clinic, and more are just a few minutes away. This area truly has it all! If you love luxury and convenience, but dream about living the beach life, you’ve found your place!